Last December 15, 2011 marked the 1st year anniversary of DarkSmurfSub, a community translated subs where fans help fans. I was signed up to review on some dramas that I am watching and liked. There are other dramas that I especially love and had become my crack for the year but some members had already signed up for them. So here are the three (3) that i contributed to the DSS Anniversary Review: Ojakkyo Brothers, Man of Honor and Flower Boy Ramyun Shop. I had never intended to watch Ojakgyo Brothers (2011). I had never really imagined myself watching or following a 50-episode long drama but then here I am, quite addicted to it already. Half-way through the drama, like most people, I am so crazy about it already. It is a weekend drama about a family of four sons living together with their parents and grandma in a farm outside of Seoul. One of the brothers, Hwang Tae Hee (Joo Won), who is a policeman fell in love with Baek Ja Eun (UEE). Ja Eun was the only daughter of a wealthy family and consequently she was brought up to a life of privilege until his dad disappeared and she faces the difficulties in life alone. The other brothers are Hwang Tae Shik (Jung Woong In), Hwang Tae Bum (Ryu Soo Young) and Hwang Tae Pil (Yun Woo Jin). Each of the brothers has an interesting life story to tell. The story anchors on the concept of family and love. Currently, the drama is still airing. We are following two OTP’s (one true pair) in this drama. Our Hwang Tae Hee and Baek Ja Eun as well as Hwang Tae Bum and Cha Soo Young. Midway in the drama and our pairs are experiencing the pain and love. Compared to the other dramas, the story of Ojakgyo Brothers takes longer to progress considering that this is a weekend family drama. But I have no complaints whatsoever about the pacing of this drama. Yes, it might not be as fast as other dramas but it’s like slow steady burn. You get to savor everything and it is like a feast to the senses. I just hope both our OTP have a happy ending. And who says they won’t? This is a family drama, we always get the happy! Jung Il-woo stars as Cha Chi-soo, Lee Chung-ah as Yang Eun-bi and Lee Ki-woo as Kang Hyuk. It started out as a buzz about Jung Il-woo’s anticipated drama after his much acclaimed drama role as The Scheduler. 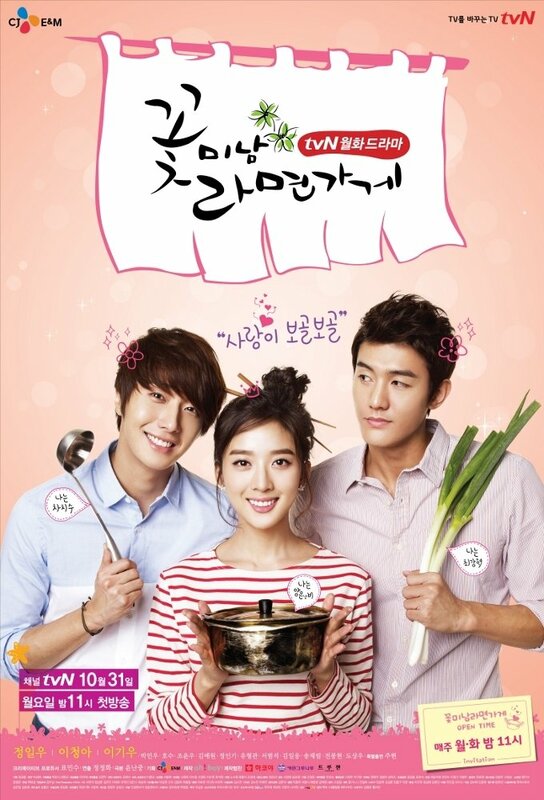 Then, posters were coming with the “flower boys”, making viewers expect nothing more than fluff. I signed in to watch this FBRS to enjoy myself with a light and funny drama. It turned out to be more than meets the eye. Initially I thought it is a mash-up of various dramas such as Hello, Teacher (2005). But FBRS played along well to be its own brand of drama. It is amazing that writer-nim could actually play along with the episode title to its full benefit. Some drama use to resort on the use of toilet humor to make the episode funny but in the end it turned out to be flat. On the other hand, its use by FBRS is taken on a more meaningful note, more so because the drama tends to be very liberal in its use of puns. We are reminded of the writing styles of the Hong Sisters, using meta on meta. What is also commendable of FBRS is how it is a mix-up of so many things and yet it still feels so original. There is an integration of makjang here as a birth secret between two characters – but it was downplayed so well and didn’t overdo the melodrama at all. Ratings-wise, FBRS put the cable standards a notch higher. Being a cable drama gave it much leeway on things that are generally taboo on mainstream tv. When kissing scenes has limitations in a mainstream tv, FBRS shown on cable allowed us to see a much awaited kiss. Hell, that was one of the best kissing scenes ever! I was a little wary of this drama simply because it was created by the PD-writer combo who gave us Baker King Kim Tak Gu, which up till now I had never seen because of its makjangness. When the casting was finalized, I decided to go see this drama, but with caution still. I had admired the previous works of the cast: Chun Jung Myung, Park Min Young, and Jang Woo, all of whom were good in previous dramas. At first I was expecting this drama’s plot to revolve around the life on baseball since most promo materials were about the two main guys in sports uniform. Clearly, after two episodes, baseball is nothing but a plot device to kick off the drama. It was also clear that I was in love with the OTP (Young Kwang and Jae In) after episode 2. What draw me in this drama is how compatible on screen Young Kwang and Jae In are. Aside from the believable pairing, the third lead likewise delivered his piece. He is good enough to warrant an alterna-ship. The villain exaggerates in his characterization that at some point you would find him funny instead of being mad at him. What I also liked about this drama is the incorporation of the element of fantasy. It made the makjang less bearable. But makjang will be makjang and the introduction of fauxcest sometimes make me grab my hair. It dragged through that almost half of the drama was eaten by said plot device. There are instances that you’d get frustrated by the sheer absurdity of the situation. In general though, Man of Honor delivers and is engaging to watch but something I would not watch again. This entry was posted in Dramas and tagged Chun Jung Myung, Drama, drama review, Hwang, Joo Won, Jung, Jung Il Woo, Lee Chung-ah, Lee Jan Woo, Lee Ki-woo, Park Min Young, Seoul, UEE. Bookmark the permalink.